Copenhagen was the center of world attention, but there was not much ‘Wonderful Copenhagen’ about it when there were blue lights flashing in the city. On top of a chaotic and unsuccessful climate summit comes the concern about the unique Danish forms of law enforcement. And on top of that comes even more democratic sadness that everything that happened, was backed 100 percent. up by the government and much of the opposition. If we consciously forget what happened, and without discussion goes into 2010 with the same laws, authorizations and attitudes, we say yes to that the most authoritarian form of authority will have even more power next time it becomes crucial. The demonstration on 12 December was a fantastic experience. 100,000 people from around the globe participated in a moving public celebration, which sent a strong signal of seriousness and impatience. It was a demonstration of all colors and ages. It was marred only by members of the ‘black block’, who behaved, in particular with throwing cobblestones in Christianshavn. One policeman was wounded, and I know from demonstrators – including a group of college students – that they were glad when the police intervened. But the scale and form, with hundreds of people handcuffed put to ground in train position on a freezing Amagerbrogade was indecent. One could have sorted the innocent out, one could have made a focused action. We could – because too many were arrested – have apologized and corrected. But no. 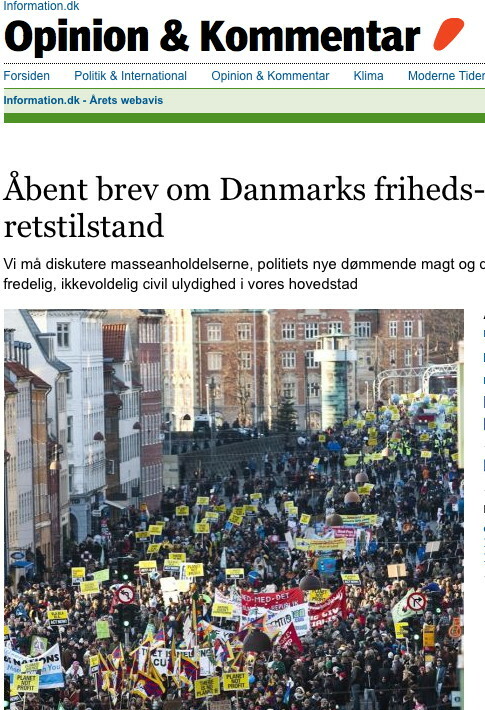 It is well documented in articles in Politiken and JP.dk that part of the ‘black bloc’ was sent into the rally by police. These activists were on their way elsewhere in the city, but was stopped by police and was told that the only demonstration opportunity was the big demonstration. They were not a part of the popular demonstration, which was as popular as announced. I was the spokesman for 12th December-rally, and I was asked countless times about the risk of violence. We distinguished clearly between groups like Never Trust a Cop (NTAC), which announced violence, which we denounced, and the Climate Justice Action, which openly put forward that the other day they would commit nonviolent civil disobedience, but was loyal participants in the 12th December-demonstration. We felt that if there ever came turmoil, it was in the city, while others went to Amager. It was what NTAC announced, but what the police wanted to hinder. Instead, some of the violent were sent after the peaceful demonstration. It was unfortunate because it made people scared because it led to the arrest of innocent people and because it could have made the demonstration to beak apart and into panic. There was good cooperation with the police prior to the 12th December. There was coordination and which made sense. But an evaluation includes determination recognizing where it went wrong. And it went wrong, both because when the violent were sent into the demonstrations, when one arrested peaceful demonstrators in bunches, and when one treated them in violation of decency and common sense. This first of the great days were 968 people arrested. Almost none were sighted. The vast majority were given only to the ruling given by the police without court involvement. First sentenced to chill handcuffed train positions, then climate cages, and some to pepper-spraying. The next major action was the Climate Justice Action’s action. It was to bring critical demonstrators with critical delegates together at the Bella Center area. CJA had put everything openly forward. It was civil disobedience, but peaceful and non-violent. Personally, I was however very worried that protesters would drop peaceful unity when police arrested a day before one of the leaders, a known moderate German CJA activist. It was contrary to common sense and the advice that the police had received as part of the dialogue with them. It became even worse when one arrested two young Danish CJA responsible leaders. It was e.g. Stine Gry, which was part of 12.dec. planning and who had collaborated and informed fully open. She was rewarded with phone tapping and imprisonment. Responsible leaders will ensure that civil disobedience does not lead to violence. They ensure that the goal is not destroyed by the fact that activists are angry and frustrated and goes berserk. But despite the arrests, it succeeded. The only violence we saw in the media were police swinging their sticks. The protesters were disciplined. Although hte leadership was sent to jail, they kept themselves to the adopted virtually entirely peaceful program. The concept of democratic, non-violent civil disobedience has stood the test of Gandhi’s India to the U.S. civil rights movement and today’s Iran, and it also kept here. But despite police efforts. There were again plenty of detainees and a handful sighted. Now the frustrations were so large that there was nocturnal unrest in Copenhagen, but despite the provocation, the city was still more peaceful than in many other periods Copenhagen has experienced. Next activist event with great media attention was the Queen’s dinner, with Greenpeace’s happening where dressed up activists came into the royal chambers and dropping their banners. Police management was so embarrassed by its own failure, that police lawyers were sent to overtime to find the greatest number of articles, you could swipe these peaceful activists for. Where courts have been allowed to interfere, they would have been more reluctant than the police. Very few were sitting in prison during Christmas But typically, most long-term prisoners, were those who had participated in peaceful and non-violent actions and happenings. Police Chief Inspector Per Larsen was almost too happy. Police action had gone by the book. The so-called lømmelpakke with expanded opportunities for preventive detention was used only once. But packages can be used in several ways. Police have never before been able to act from an overall confidence that the government gave full support to whatever the police might find out. Brian Mikkelsen, cheering on the sidelines and talked about a Denmark that is so incredibly generous that there is no prohibition on the complaint. (It’s just been inconceivable that one can get rejected). What was all in all the violence? A few paving stones, some fireworks. (None of the bombs Brian Mikkelsen was talking about). Some nocturnal burning of cars. It was far less than we have experienced on several occasions. Hundreds of activists worked hard for months to organize peaceful demonstrations, and they lived up to their responsibilities. One hundred thousands of peaceful participants testified that they take climate threat seriously and want responsible action. Actions testified in no way a brutalisation of society. The answer from the state which should have welcomed the popular support, was authoritarian and restraint. If this does not lead to a thorough and self critical discussion, it will be worse next time.